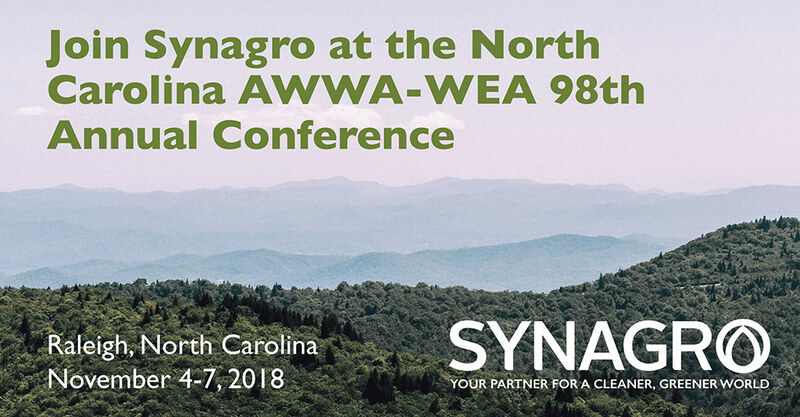 BALTIMORE, Maryland, October 30, 2018 – Synagro Technologies, Inc., the preeminent provider of biosolids and residuals solutions services in North America, is pleased to announce its participation in the 2018 North Carolina Section of the American Water Works Association (NC AWWA) and the North Carolina Member Association of the Water Environment Federation (NC WEA) Annual Conference, in Raleigh, North Carolina, November 4 to 7, 2018, at the Raleigh Convention Center. Join us inside the Raleigh Convention Center at Booth 1102 to learn about the many ways Synagro can assist you with biosolids and organic feedstocks management. From thermal drying and energy generation to digester cleaning, when it comes to biosolids, our mission is to be the most trusted provider of resource recovery solutions. We help our customers identify their needs and the solutions that are best tailored to most economically address those needs.